With an unique voice, psychedelic keys, and shredding guitar riffs, Between The Jars is a rock band which approaches classic rock with a fresh perspective. Between The Jars… that is where this young band composes its music! Soon after Between The Jars was founded, the band won three local band competitions, qualified for the Utrecht Popprijs, and shared the stage with artists including Orange Skyline, BADE, The Indien, and John Coffey. 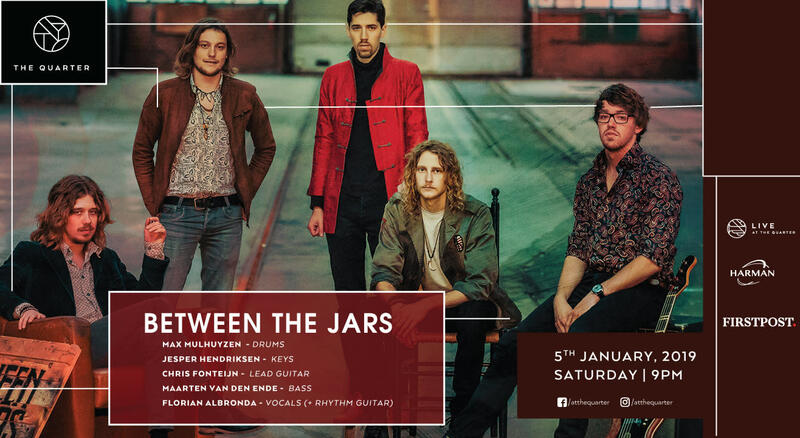 With more than 100 gigs throughout the Netherlands on stages including Paradiso and De Melkweg and a live performance of the single ‘One Of Them’ on radio station 3FM, Between The Jars is building a serious reputation. In February, 2018, after a long time of writing and experimenting with different sounds, the band recorded two singles together with producer Juan van Emmerloot (Snowy White, Popa Chubby, and Steve Lukather (Toto)) and signed a contract with record label TheRoomRecordings. The singles ‘Annie Green’ and ‘Long Halloween’ were released in May and June, 2018, after which Between The Jars made their international debut by touring through France. There, the band played for at least 3,000 visitors at the Class’EuRock festival in Aix-En- Provence. Currently, the band is working on a second EP. Stay tuned!